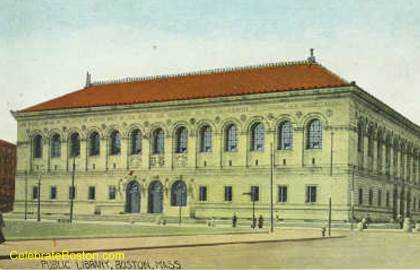 The Boston Public Library building in Copley Square was completed in 1895. It is a rare public building in Boston of beautiful Italian Renaissance style. 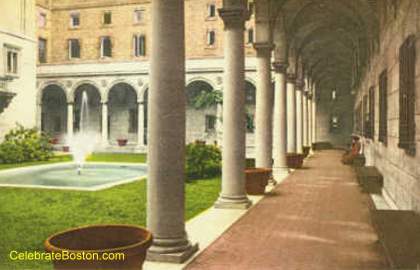 Its designer was Charles McKim, and was built to resemble a classic Roman palace; including a central courtyard. Just inside the front entrance of the McKim building is a grand marble staircase. On either side there are statues of bold lions, sculpted by artist Louis St. Gaudens. The lions are a memorial to the 2nd and 20th Massachusetts Regiments of the Civil War. Augustus St. Gaudens, famous sculptor of the Shaw Memorial on Beacon Hill, was the brother of Louis. 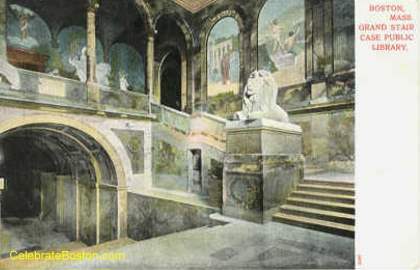 The grand staircase ends at the Puvis de Chavannes Gallery. 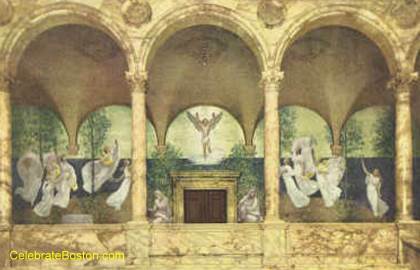 The above mural has been called Muses Welcoming the Genius of Enlightenment. There are several other paintings in the gallery, with a theme of poetry, philosophy, history, and science. About Muses, Chavannes had said, "The muses of inspiration hail the spirit, the harbinger of light." 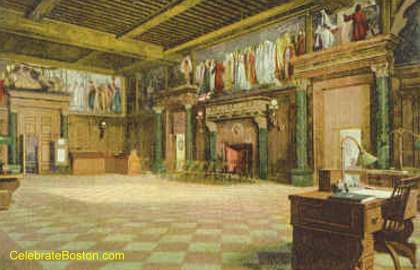 The delivery room is named after its artist Edwin Austin Abbey. There are 15 murals adorning the walls, with the subject being The Quest for the Holy Grail in Christendom. Also note, the McKim Building includes murals by acclaimed American artist John Singer Sargent. At the center of the McKim building is a beautiful courtyard, with statues and a fountain. The Boston Public Library is in itself almost a museum. It attests to the importance of higher learning in the City of Boston.